Diary Because the main road from Moshi to the south is so good the Tanzanians have radar guns. You know the scene you come over the brow of a hill from a 100km area to be confronted by a 30km sign and a policeman holding a radar gun – Bingo…75km in a 30km zone. Police man approaches window with vast in drawing of breath and then whistles between his teeth. … “Is there a problem officer?” This is a 30kph area and you were doing 75kph” “Oh kph? I thought the speed limits were in mph etc etc” “That is the most ridiculous excuse I have heard all day and 75kph is still 45mph” (Oh no that rare beast an intelligent policeman who can work in imperial and metric) “Ok it’s a fair cop guv, I’m most dreadfully sorry” “You should pay 20,000 Tsh (about $18) but you can go – just be careful” Refreshing human policeman like the British police used to be before they became young and ruthless. Off I go with a warm feeling towards the Tanzanian police. 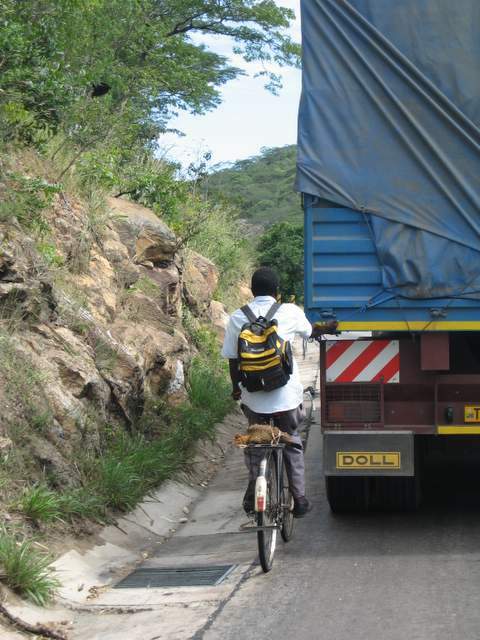 PIC SHOWS: CYCLIST GETTING A FREE RIDE UP HILL.